Deep down in the cozy book-lined dungeons of the Wheeler Centre, Community Ambassador Deb Itzkowic sat down with Lachlann Carter (left) to chat about the imminent launch of 100 Story Building, an inspiring social enterprise that he co-founded with Jenna Williams (right) and Jess Tran (middle). What is 100 Story Building? The projects implemented by 100 Story Building connect students with creative professionals from all aspects of the literary world, who undertake to share their passion for storytelling, demystify the creative process and support students to write, create and explore their literary skills. Of utmost importance to Lachlann, all of 100 Story Building’s projects have authentic outcomes and honour students’ work so that they have an opportunity to see their work being celebrated in a professional space. Lachlann is also proud of other positive side-effects of the literary programs which include building students’ self confidence and engaging their natural creative spirits in an effortless way. Four years ago, Lachlann, a primary school teacher (amongst other talents) who had been working with disadvantaged students in Melbourne’s inner-west primary schools, teamed up with Jenna, who had her feet firmly planted in the publishing world, to pursue a shared vision that combined their love of kids with their love of the literary arts. Together they followed their pied piper (Dave Eggers) to undertake a three-month internship at 826 Valencia in San Fransisco, an organisation whose mission it is to support students writing skills and help teaches get their students excited about writing. This was a role model organisation for Lachlann and Jenna’s vision and the best place to soak up the skills and experience required to implement a like-minded organisation in their home town, Melbourne. 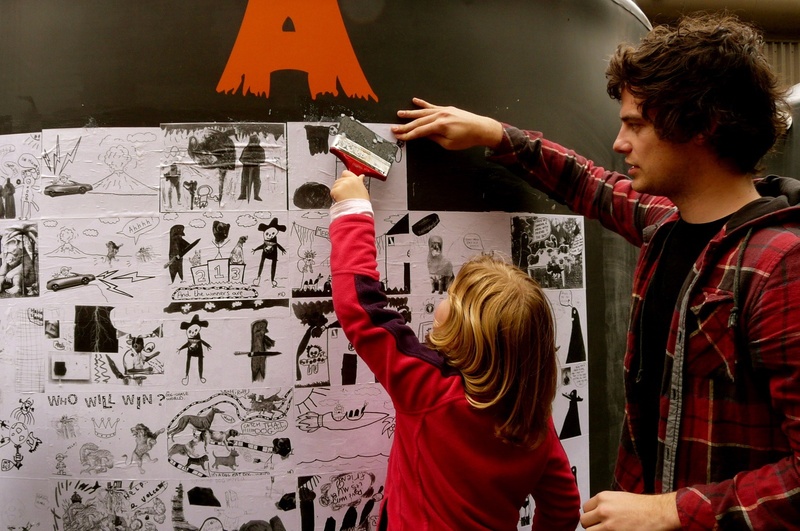 On return the pair founded Pigeons Projects, a not-for-profit organisation that delivered creative writing workshops to primary school students. Over the past four years they have been busy nurturing and growing the literary skills of marginalised children in Melbourne’s inner-west. 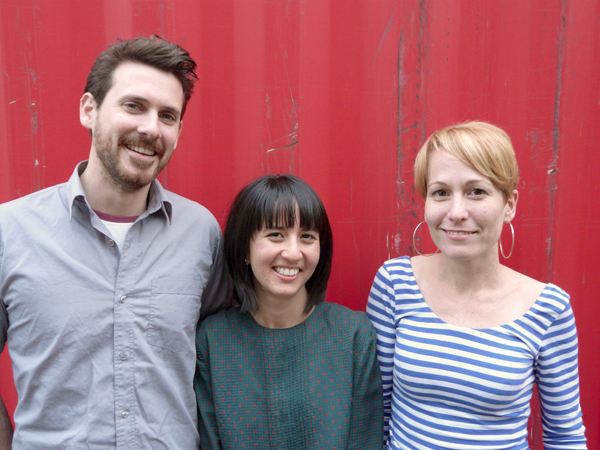 Fast forward four years later and Pigeons has written itself into a new story called 100 Story Building, where the lead authors include Alice Pung and Michael Pryor who are the Ambassadors of this visionary social enterprise. Who have been influential in helping get your social enterprise up and running? Lachlann acknowledged the amazing support 100 Story Building has had along the way from its Board members, philanthropic funding bodies, industry bodies, Melbourne’s literary community as well as the schools and students that they have worked with over the past four years. One of the main reasons that 100 Story Building has been able to get off the ground was through the support of The Social Traders program called ‘The Crunch’. During the three-month program, Lachlann and Jenna were supported by mentors who helped them develop a feasibility study for their social enterprise. At the end of The Crunch’s program, 100 Story Building participated in a pitch for investment and were rewarded with start-up funding and ongoing mentoring support which ensured that the social enterprise was viable. Since then 100 Story Building has been awarded philanthropic grants to keep them afloat until a time in the not too distant future that their social enterprise will be self-funding. Lachlann and his team have recently run a pilot program called ‘In Other Words’ in collaboration with Maribyrnong City Council. Over the course of a term Prep to Year 2, who predominantly came from low socio-economic, non-English speaking homes, were asked to create and tell their parent’s stories. The program was a holistic vision of literacy where parents, teachers and students worked collaboratively and parents were empowered to assist their kids to develop literacy skills. Each week “storytellers”, including Melbourne literary heavyweight Alice Pung, ran workshops to help the students develop their own story and their own storytelling voice. The program evolved and adapted over time when Bernard Caleo, one of the “storytellers”, introduced the students to ‘Kamishibai’, a Japanese storytelling form involving paper theatre. The students magnetised towards this art form and ultimately their told their stories using words and pictures which were filmed during the workshop. The program improved students’ literary skills by teaching them how to put together a story using a simple character and plot framework and at the same time also developed other skills such as public speaking. The school community came together at the grand finale film premiere, complete with red carpet and popcorn, which was held in a transformed classroom. (You can check out the students creative genius yourselves at a film screening at Federation Square on Saturday 27 October at 10am as part of the Federation Square 10th birthday celebration.) Lachlann is serious about ensuring that 100 Story Building programs improve literacy and explains that the program is now being independently evaluated for concrete literacy development outcomes and hopes that this successful pilot project will be run again in other schools. Another successful pilot program was run in collaboration with Harvest Magazine, where students in Year 5 and 6 convened as the editorial committee of “Early Harvest”, a children’s edition of the magazine. Each week the students participated in a workshop facilitated by an industry professional designed to explore the various stages of the publishing process. The students put out a tender for submissions, chose the stories they wanted to include (which included rejecting a number of established adult writers! ), edited the articles, designed the layout of the magazine and published it. How will your social enterprise work? Lachlann envisages that eventually the literary programs for marginalised students in schools will be funded by a range of writing workshops offered to adults and kids in the general public, using the skills, experience and networks that they have developed. 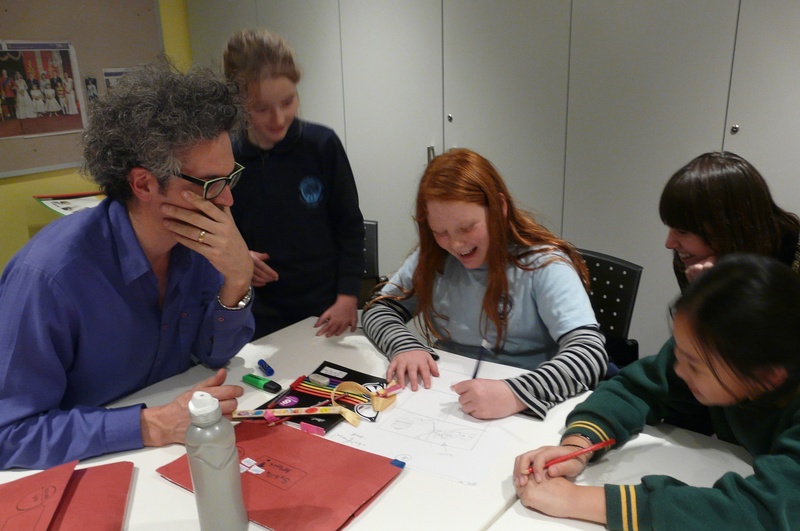 Examples include school holiday workshops for kids, master classes for adults who want to write for children and in collaboration with Hardie Grant Egmont (Hardie Grant’s emerging reader’s publishing arm) the 100 Story Studio will hold workshops where budding writers can present their work and get constructive feedback. What a fabulous enterprise… how can I get involved? Currently 100 Story Building is looking for a place to call home in the West Footscray/Flemington area. Once established, the 100 Story Studio will be the hub for the social enterprise’s ongoing programs and workshops. 100 Story Building is currently seeking enthusiastic volunteers passionate about creating it’s literary vision who can help in a range of areas including the fit-out of the studio, administration, marketing and program facilitators. Volunteers wanting to work with kids will understandably undergo a rigorous screening process including completing a working with children check. 100 Story Building will be launched on Tuesday October 30, 7:30pm – 8:15pm at the Wheeler Centre. Find out how the 100 Story Building will support the voices of more than 1000 children and young people in the inner-west of Melbourne, and how you can get involved and help to work towards 100 Story Building’s ‘happily ever after’. RSVP here.